I’m grateful to my school librarian who attended a Library of Congress week long Summer Teacher Institute a few years ago. She encouraged me to apply for this year, and as I reach the end of my week here in Washington DC at the Library of Congress, there are countless reasons I can think of as to why this has been a valuable experience. However, for the interest of time and space, I’ll just highlight 5 here. 1. 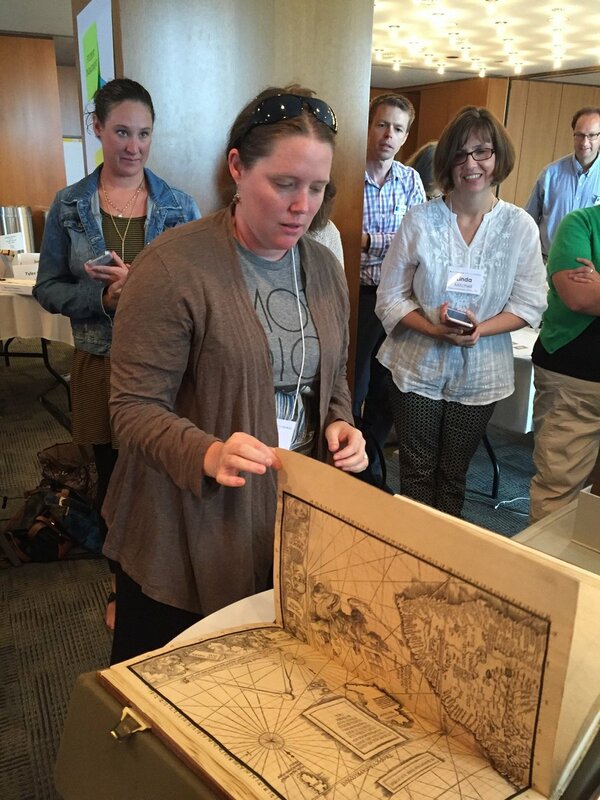 Access to rare books and people who know about them. We were lucky enough to have John Hessler talk to us for almost two hours about the Waldseemueller Map and the book it was from. He even let me touch it! One of the high points of my week was hearing him talk about the artifacts he worked with. He’s basically a real-life Indiana Jones. 2. A better understanding of how to navigate all the primary sources and other resources the Library of Congress both houses and links to on their website. 3. Time to discuss, collaborate, and share with colleagues from all over the country. I learned so much not just from my fellow high school teachers, but also from elementary and middle teachers and librarians. 4. Not going to lie, some of the excitement of coming to Washington DC has to do with the access to restaurants in the area, like Hank’s Oyster Bar, Romeo & Juliet’s and cute little bistros of all kinds. I also ran into a former student in the Library of Congress Cafeteria (he confessed it had the best food) and was able to take him out for a meal, which was a delightful side benefit of being here. 5. The ability to sink in to a #weekofgeek. Having an entire week to really think about how to use primary sources and creating a lesson plan for my classroom has allowed me to dwell in possibility in ways I would not have achieved on my own. Kate Walker is the VP for Secondary for PCTELA and a self-proclaimed book geek. Why am I reading it? Rachel (my wife) saw it on the shelf at B&N and it caught her eye. She recommended it, and I read it. Thoughts: Sure, this is a retelling of the Snow White fairy tale, but it’s a fair bit deeper and more innovative than you might assume, and not just because the title character has a gem-studded pistol and no real second thoughts about beating you in a fist-fight — or a gun fight — should the need arise. This book is short, brutal, poetic, strong, and abstract. It’s an Old West style fairy tale dealing with questions of identity, race (the half-white half-Crow MC was bathed in ice-milk and scrubbed violently by a step-mother who intended to lighten her skin color a few shades in order to make her proper and beautiful), family, abuse, and self-reliance. This is one of those books that makes it clear that fiction and fantasy can often approach truth better, having left realism behind. Recommendations: Read it. It’s short, quick, quirky, and will stick in your head. Need a strong female character? Check. Need a book with some attitude that will keep you hooked? Check. Want to leave current events behind and explore something beyond your existence, but still read something meaningful? Check. I might not recommend reading it to your kids as a bed time story, though. Make sure you’re fine with the language and content first. Jesse Olson teaches 10th grade English in State College, PA and enjoys creative writing, sword-fighting, and exploring. I was in sixth grade when the Columbine shooting happened. I remember vividly because my mom couldn’t even speak about it without tearing up at the dinner table. My father kept repeating how he didn’t know why people kept guns in their houses. I remember not knowing how to react in front of my parents; my dinner table (regarding this topic) was not a safe space. I remember, perhaps more vividly, the next day at school. All the teachers were sad. I was 12 and noticed; everyone spoke quietly. I got through 5th period and made the trek from the trailers outside to math class with Mr. Thompson. And Mr. Thompson did what no one else did that day: Mr. Thompson spent the entire class period talking to us about Columbine. He told us that it was okay to be scared. He emphasized the importance of telling an adult when you think another student is struggling or in trouble. And he used those words, too: “struggling, in trouble.” He never once slapped judgement on the shooters and I honestly believed by the end of the 47 minute period that if I knew someone was planning to hurt me, or someone else, I could tell Mr. Thompson and he could help. What was most remarkable about that class period was he let the students talk. He didn’t tell anyone their opinion was wrong, or their feelings were misguided. He simply let us talk. He also kept it respectful; he explained before calling on anyone that this classroom was our classroom and we “owned it.” He discussed having respect for others because we only know what we know; we cannot definitively say what we would or would not do in situations we are not directly in. Because he led the conversation with honesty and a high level of expectations of respect, students started talking. Almost 20 years later I still recall that specific class period because it was honest. It was possibly the first time an adult treated me like a young adult rather than a middle school child. I still think of his discussion with us when I speak to my 9th graders about Intruder Drills, or the game plan when there is an “active threat.” His kind tone echoes in my ears; I remind myself to stay calm, even if I don’t like the subject matter because it will resonate better with my students. I remind myself to emphasize that our classroom is owned by us and the tone we set is one of respect, and kindness, even when we disagree. As a teacher, I understand how uncomfortable Mr. Thompson must have been. Maybe the night of the shooting he was watching the news with his wife and said, “I’m going to talk to my kids tomorrow about this.” Maybe she reacted negatively because we know as teachers it’s tricky to talk about controversial issues and remain totally neutral. Perhaps he sat down with the principal later in the day and had to have a conversation to rationalize his choice to have this frank discussion with a bunch of 6th graders. But here’s the deal, folks: we must have these hard conversations. Currently in our country there are a plethora of issues going on, both political and social. And some of it is extremely frightening, even for adults. I challenge you to get comfortable with being uncomfortable. It’s positive for students to be able to have classroom environments that tackle tough issues. It’s positive to listen to those they disagree with. It’s positive for them to see you, as their teacher, discern the difference between strongly-worded tactical rhetoric and the facts of arguments based on data. I’m not sure which news outlet you’re tuning into lately, but it’s entirely possible students are not seeing enough respectful interactions between opposing sides. They maybe aren’t able to articulate the difference between ethical journalism and cheap reporting yet. It is possible that YouTube comments may be their main source of discussion. While all of the previous examples are “at least something” as some will point out–isn’t it part of our job to help them critically think, examine, and evaluate the world they live in? As English and Language Arts teachers we have a unique opportunity to provide a safe space where students can ask questions, research facts, speak intelligently, and walk out feeling like they contributed to something in a meaningful way. I spoke with some students regarding this topic, as we spent a portion of the previous year discussing gender and racial social issues through the texts Speak and A Raisin In The Sun. Below are student responses to the question: What are the benefits of classroom discussions regarding social (racial and gender) and political issues? The biggest benefit of having open discussions regarding sensitive topics in our classroom was how it brought our class together as a whole, and helped us to open up with each other and feel comfortable sharing our thoughts. There was this reality and truthfulness that I didn’t feel I got from other classes. It helped me to understand different sides of things, whereas at home I am only taught to believe in one side of things. Having discussions in the classroom on topics such as race and gender allows us to see that these things are worth learning about. Some people our age have interest in activism or are already seeking out more information for themselves, but others have only really seen these types of discussions in social media comment sections – with varying levels of legitimate fact. Discussions such as these are very important for the growth of understanding in high school aged students, and having them in the classroom lets us give our full focus to the topic. If subjects such as these are brought up in a classroom, where we have access to texts and the minds of our peers and teachers, we can benefit from it far more than if we were solely scrolling through comments of teenagers on the Internet trying to pioneer a social movement through their Instagram pages. Having classroom discussions helps us to constantly formulate our own opinions and gain insight from other students that we may not otherwise talk with about gender or race issues. I feel like in a classroom there is no wrong answer, and other students know that they are expected to not necessarily agree with, but respect the person sharing their opinions. It’s nerve racking talking about something so sensitive such as race and gender being one-on-one with someone because saying something possibly offensive could make the situation very awkward. I’ve grown so much this past year because of the way we discussed mature topics in English, and I truly hope I’ll have more opportunities to share my opinions in a classroom and not have to worry about judgments from others. …I still can’t talk to my mom about Columbine. I’m a teacher and she still freaks out. But I bet you anything I could talk to Mr. Thompson about it to this day. I challenge you to tackle one social or political issue in your classroom this year. It doesn’t have to be through discussion; maybe you have students journal, or research and analyze a YouTube video, or a speech. Start small; collaborate with other teachers and compare notes. These discussions have the potential to build community and trust if we hold ourselves and students to high expectations. We must remain vigilant in our cause to educate and promote intellectual conversations; demonstrating that even when we disagree, we can be kind and respectful to our fellow citizens. We must lead by example and show students that there is more than political circus rat-racing and that when ethical people stand together we can achieve things. Bio: Danielle teaches English to 9th graders at State College Area High School. She enjoys cooking, organizing, and spending time with her family. While I appreciate Bronte’s Jane Eyre, and even more so, Sir Gawain and the Green Knight, most of my after school reading falls into the category of Chika Chika Boom Boom. My son is almost 2; he loves to be read to, and he loves to point out things in children’s books. Like most children, he has his one or two favorite books that he makes me read over and over and over again. And he says, “Again… Please!” like he knows how mind-numbingly painful some of them are for me. Below are my Top 5 books to read to the tiny people in your life. These books will (hopefully) not be so mind-numbingly painful. Shameless bias here: this was my favorite book when I was little. If you’re unfamiliar, there are vibrant colors, and all the lowercase letters climb up a coconut tree. A reader can choose to read this with regular inflection, or sing it. You can even switch it up and speak with a soft tone, and then switch to a booming bellow when the letters fall– kids love that. This is the ultimate right-before-bed book. It rhymes, and the plot follows a young girl who asks her mom how animals kiss goodnight. I like it because the animals are ones that children recognize and can attempt to repeat. This book is even older than I am, and most children still love it. There’s something about an adorable bear who is looked over because of his tattered wardrobe that screams “snuggle in and read me!” The illustrations are beautiful and children can select several things to point out on each page to practice naming objects. There are several reasons I like this book. The physical pages are different lengths, which causes interest. The food illustrations are easy for children to name. And the story of a caterpillar who eats too much and gets a stomach ache is the perfect anecdote for me to remind my son of when we’re 1 grape away from having his stomach pumped: “Remember the Hungry Caterpillar story? What could happen to our belly if we eat too many sweets?” The ending will also provide the most shocked face from a toddler who does not yet know about butterfly transformation. We love trucks; by “we”, I mean my son. He knows more types of trucks than numbers (think: apple truck, box truck, cargo truck, dump truck… also see Alphabet Trucks for reference). However, his most favorite truck book is Little Blue Truck. There are a few Little Blue Truck books, there is even one about Little Blue visiting the city (hilarious for adults who have tried to drive in the city). 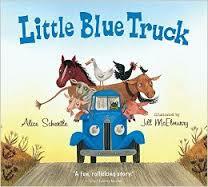 The original Little Blue Truck though is an awesome read for any toddler. It’s about being polite, and remembering that working together helps everyone. There’s also many parts where kids can chime in with “beep!” or “HONK!” This one will leave you smiling. This month’s advocacy spotlight is on School Choice in Pennsylvania. With school out and summer in full swing, many families are taking the time to re-evaluate their children’s education. Some parents, concerned with the current state of public schools, are considering alternative schools for their children. With cyber schools, charter schools, magnet schools, religious and academically driven private schools, and home-schooling options available, the opportunities seem endless. In this month’s advocacy spotlight article, our focus will be on exploring the current state of alternative schooling in the U.S., and more specifically, in our home state. The recently amended Elementary and Secondary Education Act of 1965 defines each of the alternatives to public school, and as long as children attend one of these options, they are meeting the federal requirement for education. Below is a list of alternative school options, with details about funding, status, and trends pertaining to each one. Location: Magnet schools are located throughout the country but typically tend to be located in urban environments. Click here to see the amount of magnet schools in the country in recent years. Entrance requirements: Many magnet schools use a random computer-based lottery system for admission. Some schools use assessment data or parent/teacher recommendations to determine student eligibility for enrollment, some have an allotted number of students that can be enrolled per neighborhood, and some magnet schools do not have any special entrance requirements at all. Purpose: Magnet schools were created to offer students diverse, specific learning opportunities not found within the realm of public schools. Magnet schools specifically are built off of the five pillars. Tuition: Almost all private schools require families to pay tuition for schooling each year. Some schools have financial aid or scholarships available to help families afford school. Location: Private schools are located throughout the country and across PA. Click here to see a list of PA private schools and their locations. Entrance requirements: Most private schools use a rigorous admissions process to determine student enrollment eligibility. Standardized test scores, along with a myriad of other academic factors, are used for this process. Regulation: Private schools are regulated by a board of directors or trustees and must receive accreditation from state entities. Purpose: Private schools were created to give students an educational experience that could not be found within the realm of public schools. About 63% of private schools are religiously affiliated, and the remaining schools usually have a succinct purpose (ex: gender-specific schools). Many private schools specialize in serving students with special needs as well. Focus: Private schools usually have curricula, activities, and school policies related to its purpose. Education is individualized, with small teacher/class ratios. While private schools must follow national and state rules and standards, administration and teachers are able to choose how to teach their specialized curricula. To get involved with the National Association of Independent Schools, click here. Location: Homeschooling is prevalent in households throughout the U.S. Entrance requirements: There are no special entrance requirements for students to be homeschooled. However, the parent/guardian/tutor must be a properly qualified private tutor and the parent/guardian must act as the supervisor of the student’s education program. Regulation: The department of education regulates homeschooling procedures. Students must pass selected standardized tests and his or her work (and homeschool procedures) will be evaluated annually by a teacher, administrator, or school psychologist. Purpose: While families choose to homeschool children for a variety of factors homeschooling was designed to give families and students more control over the content and direction of their education. Focus: Homeschooling allows students to have ultimate individualized instruction. Students are able to move at their own pace and have more freedom to pursue their interests. In recent years, the government has approved re-allocation of federal money to support non-public, alternative education and the families who decide to partake in this. In 2001, the Educational Improvement Tax Credit Program (EITC) gained overwhelming support from the legislature and was signed into law by former PA Governor Tom Ridge. Through this initiative, tax credits are offered to eligible businesses contributing to organizations that provide low and middle-income families with private school and prekindergarten scholarships or to organizations that support innovative school improvement programs. In 2012, the Opportunity Scholarship Tax Credit Program (OITC) was passed, allowing business contributions to fund tuition assistance in the form of scholarships to eligible students residing within the boundaries of a low-achieving school. With these scholarships, students can attend a higher-achieving public school outside of their district or nonpublic school. The EITC program offers business tax credits up to 75% (and in some cases, even 90%) of contributions made per taxable year. Children are eligible to apply for scholarships if their household income falls beneath $75,000 per year (plus $15,000 per additional child). The scholarship organizations are responsible for determining the quantity and amount of scholarships given each year. The OSTC program offers the same tax credit contribution levels to businesses and maintains the same household income requirements, but eligible students must be coming from a low-achieving school to receive a scholarship. A low-achieving school is considered a public school ranking in the bottom 15% of their designation based on Pennsylvania System of School Assessment (PSSA) scores. In the 2014-2015 school year, 49,813 scholarships were awarded in Pennsylvania alone. To see statistics for other states and programs, click here. While there are Education Savings Accounts, school vouchers, and individual tax credits and deductions offered for families in the U.S., Pennsylvania has not yet adopted any of these funding measures. To learn more about funding for alternative schooling, please visit here and to receive emails about school choice updates, sign up here. Due to recent legislation and the success of the programs listed above, the school choice movement is gaining traction in the education reform agenda in the U.S. To receive updates about the movement from REACH, a Pennsylvania coalition dedicated to educating citizens about school choice options, click here. I lucked into reading this so soon after publication because our library has a lucky day program where they have certain brand new books available only if you walk in to the library. This has been a great opportunity for me to read books with insanely long waiting lists because it was good timing on my part. 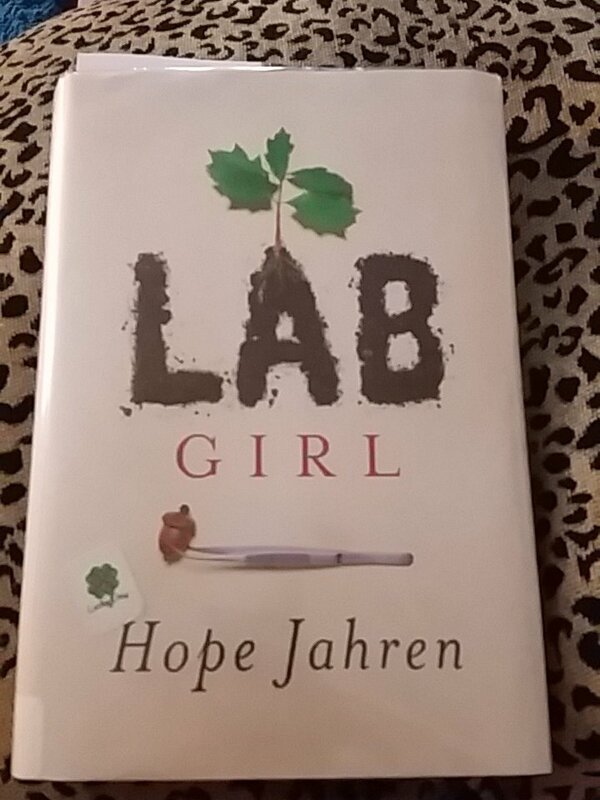 Hope Jahren’s memoir Lab Girl is not just a memoir, it is also a study of plants, a window into the world of academic science, and a story of someone with mental health issues (a part of the book I found especially compelling). I found this book difficult to put down, only stopping because I fell asleep (I picked it right back up the next morning and finished it, so technically I read it in under 24 hours). Each chapter about her life and education and scientific endeavors is followed by a shorter chapter explaining something about trees or seeds or roots or plants. As a non-science person, I found these easily digestible and simultaneously fascinating. I could also think of about fifteen students who I wanted to email and tell them to read this book immediately. Also, her blog is pretty darn interesting, and her twitter is a must-follow. The alarm on my phone buzzes; it’s actually the third time it’s gone off, but only the first I’ve heard it. I run to the shower, hair up. Naturally it’s the day we have a modified schedule and I need to get to homeroom (across the building). I also (somehow) manage to schedule a pre-IEP chat through lunch and before I know it I’m rushing home with ungraded essays in hand, and wait… I need to eat. My family needs to eat. Shoot. This happens to me at least three times over the winter. I’m not sure why things spiral so quickly at that time of year (maybe shorter daylight hours?) However, during my “down time” in the summer I prep 5 freezer meals that are good for 6 months in the deep freeze to pull out and pop in the oven for more challenging winter times. Below are my top 5 meals to freeze for your hectic school year days! Dice mushroom, spinach, saute with 2 cloves garlic for 2 minutes on high. Combine ricotta, cooked sausage, mushroom, spinach, 1 egg, 1 cup mozzarella cheese. Put in bowl, set aside. Layer lasagna noodle, bowl sausage mix, sauce, mozzarella (light), and repeat. On top noodles, layer sauce and grated parmesan. Add white wine into sauce pan, stir until wine (goes down to half), add milk, stir until thick. To warm up, thaw for 30 minutes, cook at 300 for 1h 15min. Danielle Boyd teaches English to 9th graders at State College Area High School. 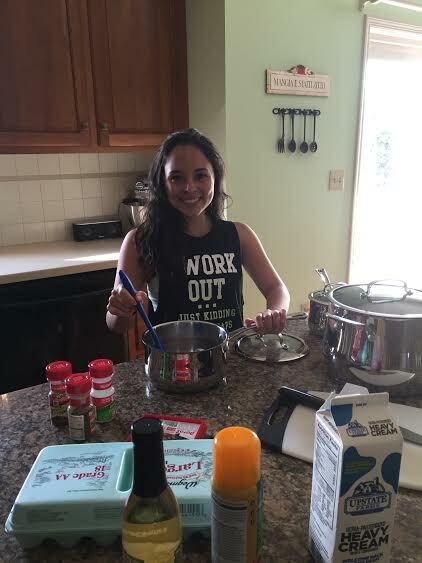 She enjoys cooking, organizing, and spending time with her family.